Grainger Public Relations » Penguins Prepare for Antarctic Blockbuster! Penguins Prepare for Antarctic Blockbuster! A long-lost penguin, which has finally returned home after more than six decades, came face-to-face with its human-sized counterpart in Dundee today (Wednesday 23 April 2014). 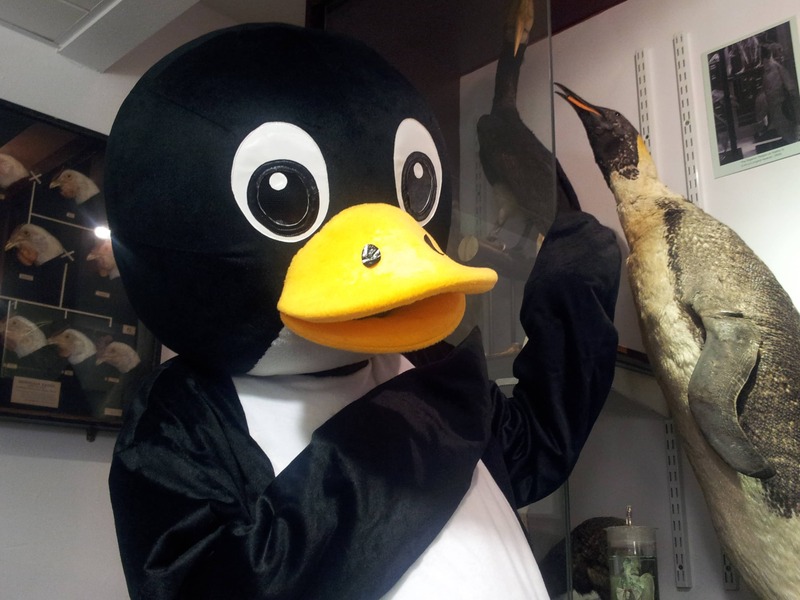 The huge Dundee Science Centre penguin paid a visit to the University of Dundee’s D’Arcy Thompson Zoology Museum to meet the long-lost Emperor penguin which was recently discovered after leaving its original home six decades ago. The cheeky and appealing penguin, which had waddled up from Dundee Science Centre, was eager to spread the word about the blockbuster exhibition heading to the Centre this Summer. ‘Ice Station Antarctica’ is being brought to Dundee direct from the Natural History Museum, London (first time outside of London, in the UK) and will be open to visitors from July through to September 2014. The stuffed Emperor penguin was misplaced after D’Arcy Thompson’s original museum was demolished in the 1950s but was recently discovered at the McManus collections Unit in Barrack Street, where conservation work was carried out to have it brought back to life, fit for viewing in its new home in the D’Arcy Thompson Zoology Museum. Linda Leuchars, Head of Science Learning and Public Engagement, Dundee Science Centre said, “With our fantastic and highly interactive ‘Ice Station Antarctica’ exhibition just a few months away, we thought these penguins, both Emperors, should be friends! The chilly continent of Antarctica will be making an icy impact on Dundee and penguins will play a key role in that story so we’ll be hoping that our many visiting ice cadets will learn more about them, and discover whether, like penguins, they could survive the extreme conditions faced by scientists researching this fragile environment. Visitors to Dundee Science Centre will be able to spend a day exploring Antarctica and experience the contrast of life as a modern explorer at ‘Ice Station Antarctica’ with life as a polar explorer of the ‘Heroic Age of Exploration’ at Discovery Point with a specially discounted joint ticket being introduced from July through to September. Meanwhile, on Friday 25 April, ‘World Penguin Day’, Matthew Jarron, Curator of Museum Services at the University of Dundee will be discussing the importance of the ‘two stuffed penguins’ in the D’Arcy Thompson Zoology Museum, one presented by legendary explorer Ernest Shackleton and the one recently re-discovered and re-displayed, which it is now thought might be one of the earliest emperor penguins to reach the UK. The event, part of a series of lunchtime talks marking the 20th anniversary of the University’s public museum service, will take place in the main Museum Services building, Hawkhill House, 5 Hawkhill Place, Dundee at 1.15pm. There is no need to book but space is limited.